The elevation of content in the above passage to at least the height of its language is emblematic of the blurring of genre in this book, not only in the relative importance of its complex, sometimes opaque, ideational element that often upstages its quite accessible diction, but also in the nature of the content itself—in this instance, the “inch or so of sun times the length of the window . . . the length of the street times once upon a time.” While Bang’s deceptively simple word selection is both quite necessary and quite virtuosic, given both the depth and breadth of writings from which almost each poem is gleaned, I must mention that her lengthy notes referencing the works and the processes by which she created her text are as much a part of the manuscript as the poems, reinforcing the relative position of content in the poet’s prosody. It is from this abyss that Bang writes. But it is not a wholly foreign place. In the lines “ . . . The idea, she knew, was to remain awake, // and while walking through the day’s gray fog, trick the vaporous / into acting like something concrete . . .” she is hovering between events and the sounds we make about them. When she declares “I’m sick of explanations. 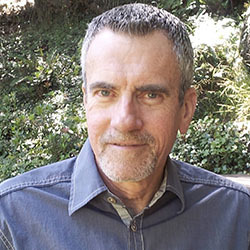 A life is like Russell said / of electricity, not a thing but the way things behave,” we glimpse life somewhere between verb and noun. When she states “ . . . every chapter / once was titled The Moment Is the State Suspended,” we are confronted with a stasis that suspends time itself. And for all of Bang’s concrete images, she frequently takes us to the blurry world at the edge of abstraction with language like “in the margin of fear.” Most of the passages above are from poems that have paragraph-length notes—indispensable to the complete understanding of the book—because they serve as a final “found poem” that illuminates many of its slant and somewhat obscure references.
. . . Nothing was neutral. spatter and drip ripped fabric. And evening collapsed. rain at the window created an instant vertical sea. 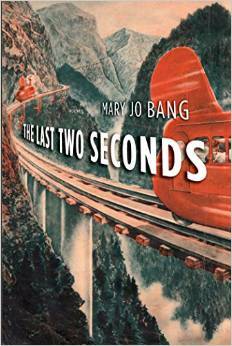 In The Last Two Seconds Mary Jo Bang finds no solution to how to stop the inevitable countdown of the doomsday clock. But, ironically, she does find a language to chime in the gap between the questions and the answers, with humanity lying on its deathbed. And, after all, isn’t finding that language the purpose of poetry?